k n o w s m y n a m e ! The forest was teeming with life—this had to have been the “New Leaf” that Sloe sometimes spoke of when she’d been teaching him. The start of it had been a little chilly for him, but gradually life bloomed over the entire forest. Prey seemed to stir under every blade of grass. At one point Kit had been startled by two young rabbits springing a mere whisker’s-breadth from the tip of his nose. This had been well away from the border, and he’d given chase but had ended up empty-pawed. Sloe had barely begun to teach him how to hunt mice before she fell ill, rabbits seemed frustratingly out of his reach. At seven moons old he was starting to feel the pangs of his lack in knowledge of the world. Now, of course, he could taste the smell of all sorts of tempting prey. Even near the border he could see whiskers peeping out from between blades of grass and birds that fluttered noisily over his head. Kit’s paws itched to give chase as he carefully stuck to the scent marks. He felt exposed even under the lush trees—his brown tabby pelt had been perfect for hiding in the area he’d grown up. Then again, if it were colder he felt he would have blended in far better. Amidst the lush green undergrowth and the dappled sunlight that filtered through budding leaves he felt like he stuck out like a great lump. I’ll catch them this time for certain, Kit thought, twisting his ear to hear behind him. He knew little of the Clans beyond what Sloe had told him—or simply what he’d overheard as superstition from other cats. The main lesson, of course, being that no cat should go near their borders. That they patrolled them diligently and would tear the fur off of any who was fool enough to trespass. Since Sloe’s painful death he’d been trying to find said patrol. It had taken him a bit of thinking outside the box to consider that the cats didn’t march up and down the borders constantly—which made sense he supposed. If he wanted to patrol his own homeland he wouldn’t sweep the border at all times, but send out cats at certain times. The issue had been discovering when Clan cats set out to do this mysterious patrol. He knew they went, because the border’s scents never waned. However, he daren’t wait for them all day. The young tom was terrified at the prospect of overstaying what fragile welcome he might have even just at the boundary line. Of course this meant that his scent had been at the border—and frequently too. He wove carefully through green grasses as he kept his ears strained for sound. The young tabby was clearly no older than an apprentice—a bit puny at that. He hadn’t been eating properly for a moon, unable to catch prey effectively with the clumsy paws of one inexperienced and untaught. He’d be lying if he said the only reason he was interested in joining a Clan was because of the fascination he held for the strange cats. This was slowly becoming a matter of life and death—Kit could join a Clan, or he’d eventually have to find a group of Rogues to take him in. “Here,” Kit decided, satisfied as he found a nice tree to sit next to. He nestled himself against the bark—foolish for a cat to do so close to a border as it could corner him, but Kit was young. The tom carefully settled down, curling his brown tail over snowy paws and staring out at the forest with wide eyes. His heart hammered in his chest, Don’t panic. Don’t be aggressive. Be polite. Be friendly. Don’t be hasty. Oh Sloe, I’m sorry, I know you never wanted me anywhere near these cats. They call us problem child, we spend our lives on trial, we walk an endless mile, we are the youth gone wild. It had been two moons since her warrior ceremony, but Lioncloud never got over the burst of joy and pride in her chest whenever she left camp. No more letting her mentor know what she was up to every heartbeat of the day, no more sneaking out of camp, no more chores, no more warriors looking down on her…okay, so maybe some of the more senior warriors still did, but who cares about them, the old flea-bitten felines. She was a respectable warrior now; she could do whatever she wanted. She didn’t have much of a goal in mind other than to stretch her legs, maybe get a bit of hunting in. Birds could be more aggressive in newleaf, defending their freshly-made nests, but Lioncloud relished the challenge. No bird was going to show her up! Linocloud paused at the nearest tree, leaping at its trunk, digging her sharp claws into the bark and pulling herself up one step at a time. The she-cat alighted on the first branch with ease, balancing neatly on the limb while she surveyed her surroundings. The ground seemed so far away; she felt she towered over the rest of the lands. A pair of robins twittered at her from a higher branch, but they were too skinny and on too thin a branch to be worth her time. The warrior leaned forward and dropped off of her branch silently. She fell almost full-force on the bird, pinning it and quickly dispatching it with a quick bite. Lioncloud grinned to herself, pleased with the catch. The grin fell away when a different scent caught her by surprise: a cat of some sort, not ThunderClan and definitely not SkyClan. With narrowed eyes she peered through the branches and the unfurling leaves- it took her a minute, but she soon spotted the intruder, his mostly-brown pelt blending in partially with the oak he leaned against. The fresh-kill will be fine left on the branch. She unsheathed her claws and began climbing down the trunk of the tree, scraping the bark roughly as she went. ‘Good enough,’ she thought to herself when she was halfway down. Lioncloud pushed off, falling the rest of the way down and landing with a dull thud on her paws. She wasted no time in whipping around to face the tom. “What are you doing here?” The warrior questioned, tail lashing behind her. But really, what was he doing here? He was hardly old enough to be wandering on his own, even for a loner or kittypet. It was the only reason she didn't immediately drop into a fighter's stance. "Leave, or I'll pick you up and toss you over the border myself." Gingersplash had never been very confrontational. Indeed, ever since the long ago days of his youth, the cider splashed tomcat had been quite the placid feline, much more fond of using his words as opposed to his claws. Perhaps this was why he always seemed off in his own little world, daydreaming of StarClan knows what, enraptured in a daydream that only he seemed to understand. He'd never been very 'warrior-like' - his past mentor, Frostfoot, had made that burning fact known well enough - and oftentimes, though he slept in camp and shared meals with his camp mates and even engaged in idle conversation, it felt as if he couldn't be any further apart from the cats he'd so come to treasure. So it was strange, therefore, that on this particular day Gingersplash found himself patrolling the borders, ears pricked and nose twitching as he glanced carefully out for intruders. He wasn't incredibly territorial, like most clan cats were known to be - and honestly, the animosity and stifling rules of the Clans was something he'd always fail to understand - but as he skirted along the strong SkyClan markers, leaving his own scent every so often to join in the strong, lingering smells of his other camp mates, the lean warrior found this was the perfect time to relax. Camp always had his mind in a muddle, and often there were senior warriors often snapping and muttering about how he should make himself useful about the place. And then there was Tawnygaze, SkyClan's talented medicine cat, whom he'd been seeing far too much lately...With a small shake of his well-groomed pelt, the tom picked up his pace, restlessly pushing such distracting thoughts from his mind. He would've continued wondering on, absentmindedly checking the boundaries, if he hadn't caught a strange, lingering scent right then and there. He froze, paw held just above the ground, ears swiveling atop his head as he cast his senses wide in the search for something...abnormal. He heard it then; a familiar tone, feminine and sharp. Gingersplash swallowed, immediately recognizing the distinct voice of Lioncloud; a young warrior, so much younger than him, but fearsome all the while. He bounded deeper into the brush, weaving his way around a tall, brooding pine, and soon stumbling upon a rather unusual scene, to say the least. Lioncloud hadn't assumed a fighting stance, which relieved him to no end, as the intruder that stood before her seemed little more than a kit. He was small, dark tabby pelt clinging to his sides, and if Gingersplash had to guess, he'd pen him at five or six moons old. Just as he emerged from the underbrush, Lioncloud spoke once more, "leave! Or I'll pick you up and toss you over the border myself." Perhaps it was best that he intervened now..."Lioncloud." Silently he cursed himself, for not sounding as assertive as one of his age should. Honestly, who's the older one here? "Let's...let's here what he has to say first." A rare, gentle flame alighted in his meadow-green eyes, his gaze falling upon the young cat with an obvious care. He'd always been quite fond of the youth, particularly when it came to kittens, and clancat or not, this kit was barely beyond apprentice age. He settled down besides Lioncloud, a comforting purr rumbling deep in his maw - how intimidating it must've been, pinned by two older, significantly larger cats against the back of a tree. "What brings you to SkyClan, young one? Are you lost?" A strange she-cat appeared out of nowhere—or so it seemed for a moment to Kit. The young tabby bushed his fur out in alarm as she landed in front of him, forgetting briefly his calm coaching a few moments before. He took a step back and found himself pressed flat against the bark of the tree. Words tried to work out of his mouth, but he couldn’t find them. For a moment he was lost to a rush of exhilaration—fear, excitement, anxiety, hope—so that he couldn’t quite think straight. Wait! Kit wanted to say out loud, but he couldn’t seem to remember how to translate the thought to word. He winced at the she-cats words. Leave—alright this was to be expected. Sloe had told him constantly that they were aggressive. That they would tear the pelts off of any cat who crossed their borders, regardless of who or why they were there. Kit had hoped that the Clans were a little talked up by the rogues and loners of the area. It made sense for a group of cats—as strange as it was for a group to permanently live together—to be protective of their land. After all, they had mouths to feed. Oh. Very brilliant. 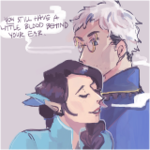 His eloquence likely made Sloe—wherever her soul resided—very proud. Maybe he should try walking straight into the heart of their territory with that line next time. They’d welcome him open-pawed. Um—how poetic, it was earth shaking. If Kit had the ability to do it without looking foolish he’d have cuffed himself upside the head. Another cat joined the first as he was thinking this. Two of them? Oh Sloe, what have I done? Kit flattened himself to the ground, and was surprised when… when the newcomer appealed for him. Hope flashed in Kit’s eyes, gathering warmth and gratitude at the kindness in the other tom’s eyes. He’d been right, the Clans could be reasoned with. A slow and shaky sigh gusted from the young tabby, and he perked his ears up at the question. 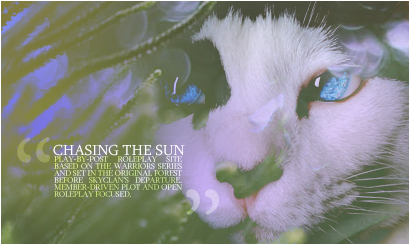 “SkyClan,” Kit meowed softly, childish wonder and excitement lit his eyes. He lifted his eyes to the sky briefly, before shaking himself. Right, he had important things to discuss. He weighed these words for a moment. He could ask for their leader, but he did not want to seem like he was making demands. He did not want to seem, also, as though he were being hasty. He glanced uncertainly over his shoulders. Though he spoke carefully he couldn’t help but feel as if the tree behind him were the only barrier. There was little going back. This was his last hope.